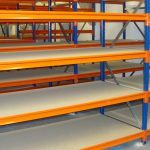 Used Pallet Racking - Shelving & Racking Ltd.
Used pallet racking is a cost effective way to store palletised products. 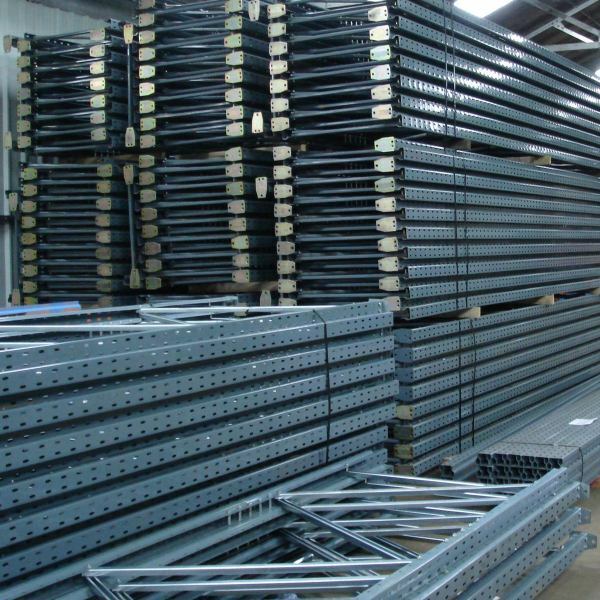 Our high quality used pallet racking is checked to SEMA specifications for rack inspections. 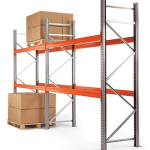 We are the UK’s largest stockists of second hand pallet racking systems, with Dexion Speedlock, Dexion P90, Apex, Link 51, HiLo Rackplan, Hilo Premier Rack, Redirack, Polypal, Planned Storage Systems (PSS), Mecalux and many other makes of warehouse racking available for quick dispatch. 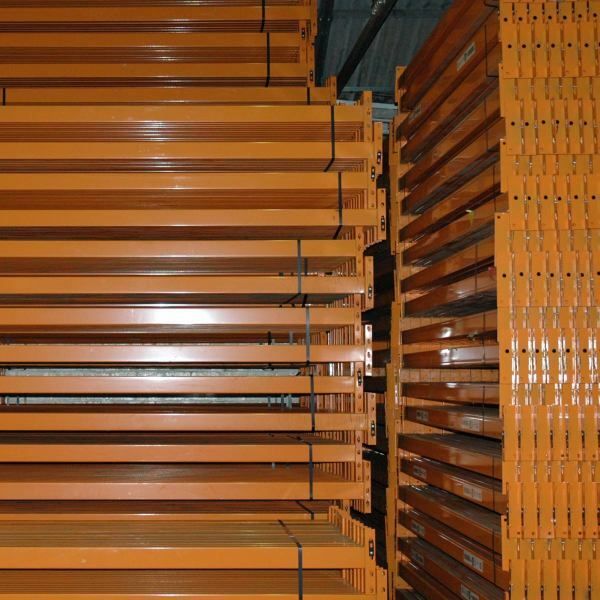 If you need used pallet racking from a specific manufacturer, please click here. All frames are supplied assembled (2 legs braced together) and with fixing bolts. The beam price is for a single beam with locking pins. 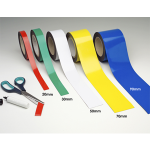 Click HERE to see special offers on this product. 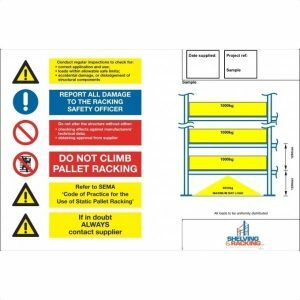 If you have used industrial pallet racking to sell please call us on 0800 612 3210. 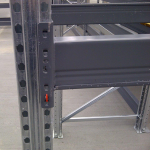 Every pallet racking frame is supplied assembled, with footplates attached and fixing bolts included. 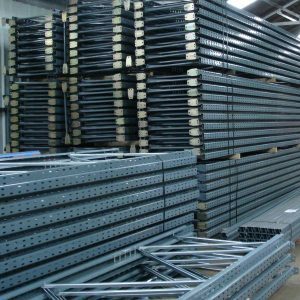 We can supply frames from 2000mm high to 9000mm high and in standard depths (900mm or 1100mm) or bespoke to suit your specific requirements. Please let us know if you are looking for a specific make of pallet racking, and if you are adding to a system you already have in place, so that we can supply racking which is compatible. Discount will be applied to the used frame list price at the checkout. Price is based on frames bought with beams, frames bought on their own will incur a surcharge. Please call us on 0800 612 3210 for more information. 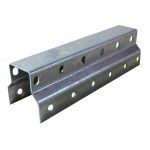 All our used pallet racking beams are supplied with two beam locks as standard. 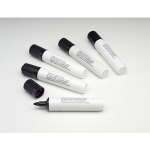 All orders are checked to make sure they meet SEMA guidelines before dispatch. 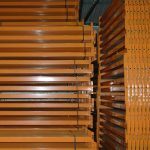 Please let us know if you are looking for a specific make of pallet racking, and if you are adding to racking you already have in place, so that we can supply racking which is compatible. 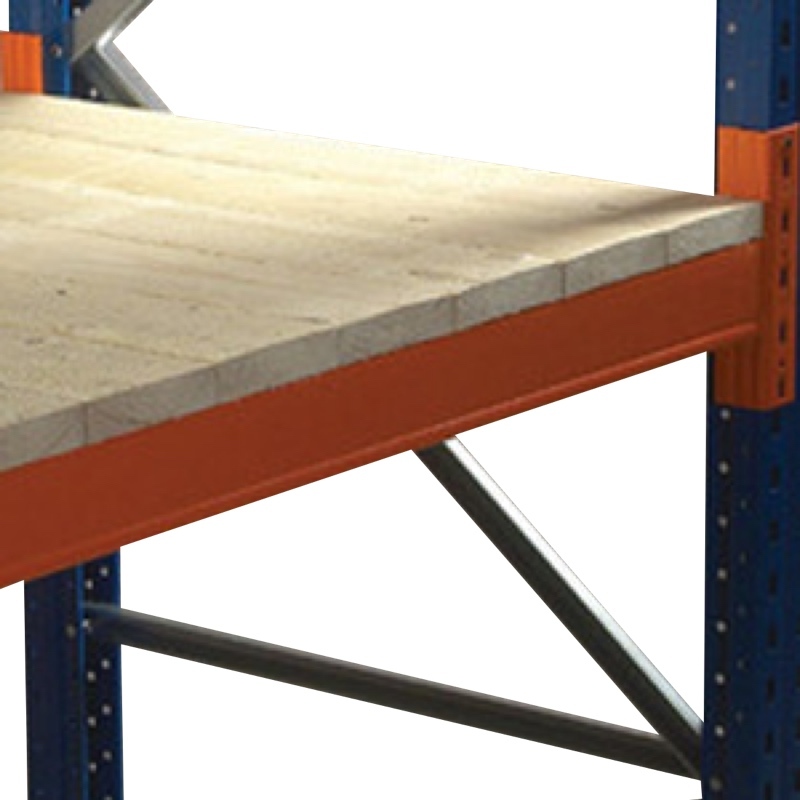 Pallet support bars are a useful way to take some of the weight from pallets on your racking. 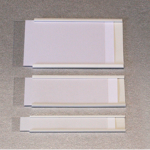 Two support bars are used per pallet. These are new pallet support bars, but we do have used bars to fit most makes of pallet racking available on request. 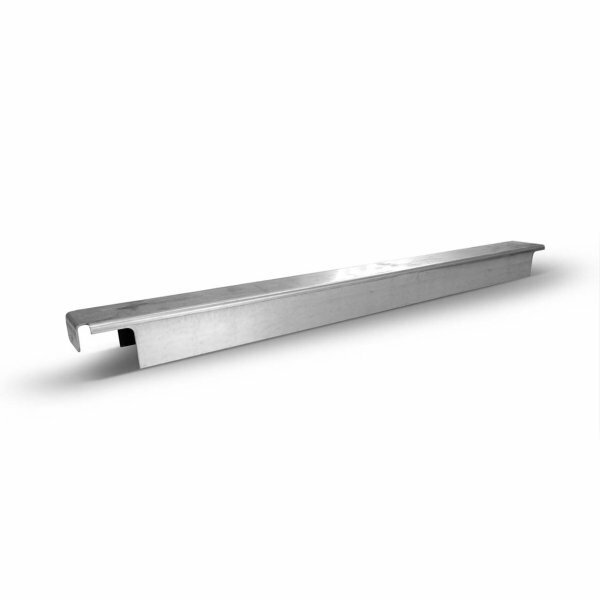 Our support bars are for 900mm and 1100mm deep pallet racking but other sizes can be fabricated in our warehouse. Discount will be applied to the support bar list price at the checkout, dependent on total order value. Timber decking is designed to support pallets on your racking but can also be used as a shelf for non-palletised items. 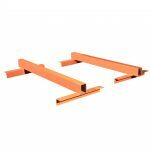 Our open boarded decking has a 50mm gap between the wooden slats and the batons underneath hold it in place between your racking beams. Available in standard sizes but can be altered to fit any pallet racking system on request. Discount will be applied to the decking list price at the checkout, dependent on total order value. Close boarded timber decking for pallet racking is designed to support pallets on your racking but can also be used as a shelf for non-palletised items. Our close boarded decking has no gap between the wooden slats and batons underneath hold the deck in place between your pallet racking beams. Our timber decking is available in standard sizes but can be altered to fit any pallet racking system on request. 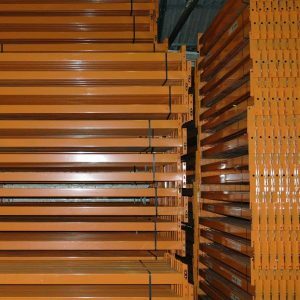 Discount will be applied to the close boarded timber decking for pallet racking list price at the checkout, dependent on total order value. Wire mesh decking is designed to support pallets on your racking but can also be used as a shelf for non-palletised items. 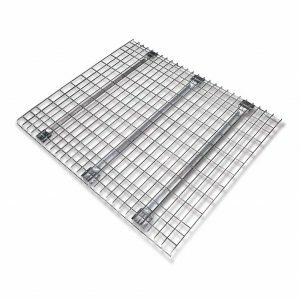 Our wire mesh decks have a 50mm x 100mm gap between the 4.5mm wire and steel supports that hook over the pallet racking beams. 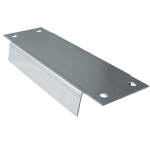 Available in standard sizes but can be altered to fit any beam widths on request. 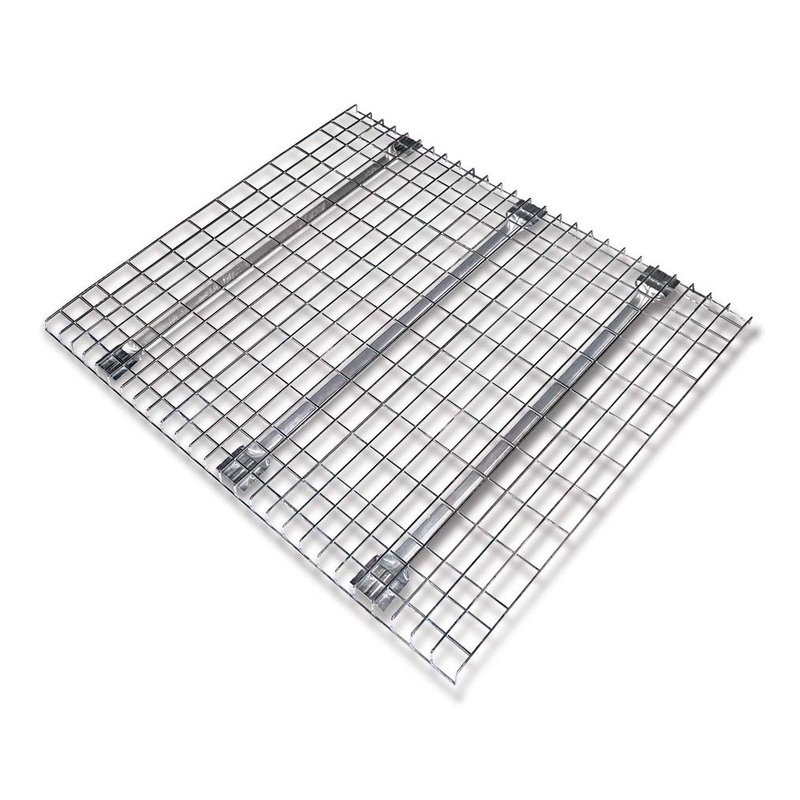 Discount will be applied to the mesh decking list price at the checkout, dependent on total order value. An accidental knock from a fork truck could be potentially very costly, both financially and in terms of productivity. Our pallet racking column guards are a cost effective way to help prevent damage which could lead to frames having to be replaced and whole bays having to be emptied. Easy to install with fixing bolts supplied with each column guard as standard. 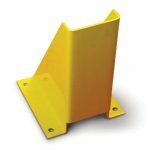 Discount will be applied to the column guard list price at the checkout, dependent on total order value. 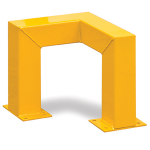 Narrow aisle column guards are an essential part of some pallet racking systems. They can prevent expensive and time consuming damage from fork lift truck collisions. Made from 5mm steel and bright yellow for maximum visibility. Easy to install using the fixing bolts supplied with each column guard as standard. Available for quick dispatch to any UK mainland address. Discount will be applied to the narrow aisle guard list price at the checkout, dependent on total order value. 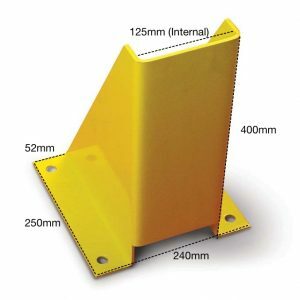 This pack of 10 narrow aisle column guards is an essential part of some pallet racking systems. They can prevent expensive and time consuming damage from fork lift truck collisions. 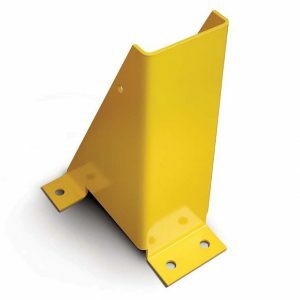 Discount will be applied to the narrow aisle guards list price at the checkout, dependent on total order value. Corner guards are an essential part of any pallet racking system. 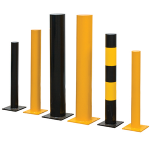 They can prevent expensive and time consuming damage from fork truck collisions. These corner guards are intended to go on the ends of runs of pallet racking. Made from 5mm steel and bright yellow for maximum visibility. Easy to install using the fixing bolts supplied. Discount will be applied to the above list price at the checkout, dependent on total order value. Our modular rack end barriers provide protection for your pallet racking from potentially expensive damage by fork trucks. 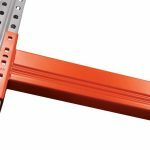 They are available in a range of sizes to suit any single or back to back run of racking. They can also be used on pedestrian walkways. Easy to install using the fixing bolts supplied. 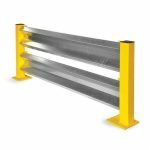 Discount will be applied to the modular barrier list price at the checkout, dependent on the total order value. 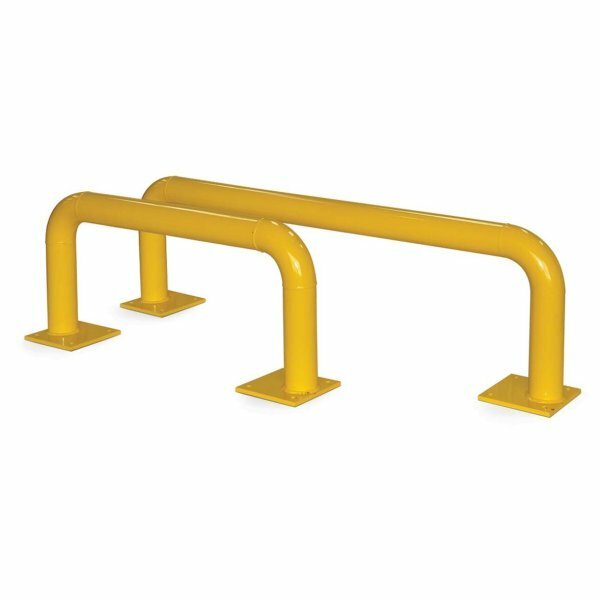 Our tubular rack end barriers provide protection for your pallet racking from potentially expensive damage by fork trucks. 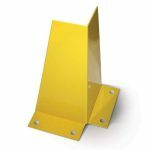 They are available in a range of sizes to suit any single or back to back run of racking. 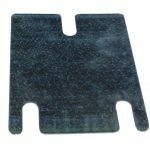 They can also be used on pedestrian walkways. Easy to install using the fixing bolts supplied. 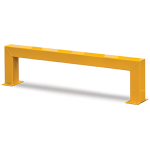 All our tubular rack end barriers are 400mm high. 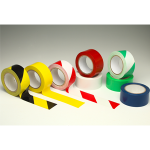 Discount will be applied to the barrier list price at the checkout, dependent on the total order value. 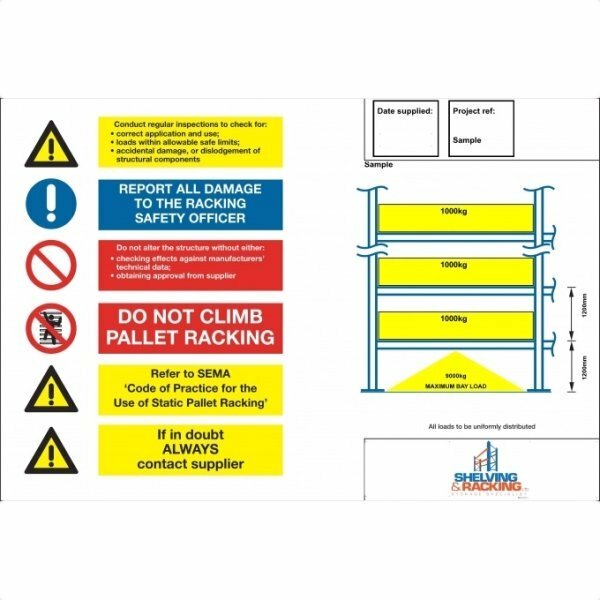 Pallet racking load notices are an important health & safety consideration in any warehouse environment. 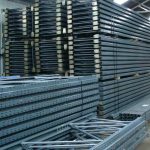 It is vital that load capacities are not exceeded in order to maintain the structural integrity of your racking system. 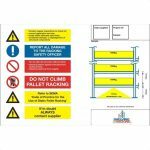 The height to the first beam level, frame duty, number of beam levels, beam pitch and load capacity will need to be provided in order for us to supply an accurate pallet racking load notice. 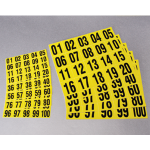 Please email us these details once you have purchased your load notices. 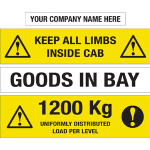 Every run in your warehouse should display a load notice and we can dispatch them quickly to any UK mainland address. 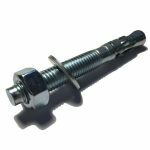 Fixing bolts are an essential part of any pallet racking system. They secure the upright frames to the floor and increase the overall stability of the structure. 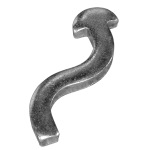 Manufacturers recommend a minimum of one bolt per leg (2 per frame). Our fixing bolts can also be used to secure column guards and barriers to the floor. These fixing bolts are an M12 x 100mm sleeve anchor. Listed price is for 1 bolt. Discount will be applied to the list price at the checkout, dependent on total order value.